Hey folks! I was hoping I could get your opinion on something. 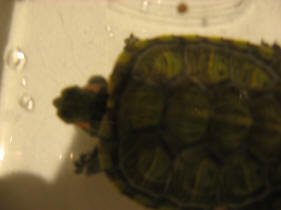 My red eared slider has/had a bit of shell rot, which I treated with iodine and an anti-fungal creme. I took her to a vet, even though there are no herp vets here, I just took her in because they have a lab, and I wanted her poop tested. Which they did, and they told me she apparently has too much fiber and starch in her poop. They told me nothing else useful, didn't give any kind of diagnoses, just told me that's bad and that I should only feed her animal matter, no plants. <This is, well, wrong. Red-Ear Sliders are omnivores in the wild, with adults predominantly feeding on aquatic plants. They should indeed be producing lots of faeces, which would indeed look quite fibrous. Of course starchy foods, such as cereals, probably shouldn't be given too often, as these aren't a natural part of their diet. Better to focus on cheap aquarium plants (such as Elodea) as sold for Goldfish system, alongside pellets and small bits of seafood. ReptoMin isn't bad at all, especially for hatchlings, though it is a bit protein rich, so as the turtle gets older, it should be given less often. Koi pellets are a good, cheap staple. I tried doing that, and now she's constipated. Probably this just layered over the fact that I was dry-docking her because of the fungus and only put her in water for about an hour every day. She hasn't pooped in over a week, and now she WON'T eat any plant matter. Even if taking her to the vet again was in any way useful, which it probably wouldn't be, it is now very cold, so taking her anywhere is very risky, especially since I don't have a car. I've been keeping her in water mostly warmer than her usual temperature in hopes that it'll relax her insides and she'll rehydrate, and I tried putting a bit of olive oil on her food, though I'm not sure if she actually ingested any. So far, no poop. Would human laxatives make a difference? Though I'd be scared of trying to force-feed anything because of the risk of it going in her lungs instead. My six year old grandson's turtles are in my care as his parents won't allow the turtle at their house and I desperately need your advice and help. I don't know what I am doing although I am trying. Attached are pictures of the turtle in question. Two turtles were purchased as hatchlings in January, 2018. One grew normally and is a 4 to 5 inches and the other is only two inches and has developed a growth on the side of its face. I read that because they are the same species that one is dominant and the reason for the one with the growth not growing at the same speed as the other. I followed the instructions and separated them immediately, new tank (one 50 gal and one 20 gal) heat lamp on 24/7 and UVB lamp on 10 to 12 hrs a day plus basking pad, etc. in each tank. Any advice and help you can provide me would be greatly appreciated. Neale, Thank you very much for your prompt reply. I found it most helpful and will definitely follow your advice. I do have ReptoMin but the little turtle prefers Aquatic Turtle food with added vitamins and minerals - the hatchling formula. It is also a fussy eater contrary to the other turtle that was obtained at the same time. Also, the other turtle is a normal size for its age, is a good eater, etc. Thank you again for the great service you provide. I have two red eared sliders both two and a half years old. They are in a 50 gallon tank about three quarters full, they have access to basking area, water heater, canister filter, uva and uvb lamps. Sometimes I take them out for direct sunlight. I am feeding them every day with 3 - 4 pellets (either ReptoMin or zoo med growth formula) and red leaf lettuce or romaine lettuce in the size of half their shells. Occasionally also carrots, fruits like blueberry, strawberry, banana, papaya and grapes, and dried shrimps. <almost none of which would be anything they'd ever run into in the wild. However, they are not growing very fast, they are still a bit under 3 inches SCL. They also have retained scutes and quite bumpy shells (one is worse than the other), slightly curling upwards. So I am in a dilemma, I want to feed them more food to make them grow, but I am afraid that this will make their shells worse. I am also worried that if I am not feeding enough, their growth will be stunted. <Feed them all the ReptoMin pellets they'll eat in 5 minutes ... 6 days a week in summer. 3 days in winter. No dried shrimp, berries or pork chops. I have friends also with sliders and they are feeding heaps of protein but their sliders are bigger than dinner plates with beautiful smooth shells. I would appreciate it if you could give me some advice as to how to help my turtles. Thanks Darrel for your reply. About the beef/chicken liver, should it be raw or cooked? I noticed a bean sized floating object in my turtles tank. It was dark greenish. When I retrieved it, I pushed it too hard against the bathing rock and it popped. The fluid inside was maroon colored and mucous like. It didn't mix into the water so I was able to get it out. I'm just wondering what it was and if I should be worried. She is a 8 month old red eared slider. She eats dried mealworms, shrimp, and protein pelts. She is very active and seems well. Please help ease my mind! in goa.help me. he still eats fine. please help. I have two 3 month old red eared sliders at 1.5 inch. About 1 week ago, one of the sliders started to have green diarrhea. The feces is bright green in color and has tendency attach to objects or aquarium walls. After closer inspection with magnifier, the feces looks fibrous; it consists of a web of small green fibers. At one point the slider behaved sluggish for couple days. But since then it has been acting normally and eating normally. I feed them Zoo Med baby turtle pellets once a day. UVA/B and basking light is offered close to 12 hour per day and they basking normally. Water is at 81F constantly. Water is filtered 24/7 and partial changed daily. I have been feeding them recommended leafy greens but since I first observed the green diarrhea about 7 days ago, I have stopped providing other food choices besides the pellet. <Ah, there's the answer. Simply cellulose. Turtles can't digest cellulose any more than we can, so it comes out much the same way it went in. We call it "fibre", and recognise its importance to a healthy digestive tract. I have three baby RES turtles I bought online over a year ago. They eat once a day but recently one of them got swollen eyes and bobs it's head back and forth constantly? Is he ok? The other turtle, without my noticing, got fat and now the crease In the bottom of its shell looks like it's splitting open. Is this normal? .after this third time he has been strange. Firstly, he started not opening his left eye. I looked it up on the internet and found that it may be caused by lack of vitamin A, which makes sense, because I hadn't been feeding him properly (I've been using Gammarus, made by Tetra). I found that I could use drops as a supplement, and also as medicine for the eye. Therefore, I applied Vita-Plus, the only drops I found in the pet stores here in Romania(on the bottle it says it contains vitamin A, D3 and E). He started opening his eye, but it still seems a bit swollen to me. Secondly, he had been shedding skin (I am certain it was shedding then), and I thought it was normal. Then he stopped, he looked well, clean, but then he started again. And now it looks slimy and his belly looks constantly dirty from some green stuff. I try to clean him daily with a q-tip, and the stuff that comes out is dark green. Third of all, he hasn't been basking for a while, at least not that I've seen it. I must admit that I don't have a UV light, which I will get as soon as possible, because I now realize how important it is. Fourth of all, a few days ago I brought home another YBS, the same size (and same age, I think). When I put them together, I realized that there is something wrong with my old one (his name is Barrack), because, compared to the new one, who was curious and energic and who looks very clean, I might add, he seemed lazy and sleepy and unhealthy and dirty. I am very concerned. I tried to do as much research as I could, and I asked some vets but they did not know what to tell me(turtles are not so common here). And the more I read on the Internet, the more concerned I am, because with every article comes a new possible diagnosis. I want to add that I tried to feed him ReptoMin made by Tetra, but he didn't seem to like it. Also, I used to feed him 2-3 times a day, until I realised that it is not okay. Now I feed him once a day. If you have suggestions please tell me, I want to give him the best care possible. His regular diet used to be chicken or fresh water fish and he would relish it but suddenly he has stopped eating ( i feed him with a spoon once a day)...i tried and changed his diet giving him prawns, shrimps, dry shrimps...but he just refuses to even look at it but just wants to get out of the water and demands to be picked up...its been raining the past few weeks and the sun hasn't been out so he hasn't been able to bask...so I leave him out for a while just so he is out of the water .. And also I keep him in warm water which he loves...but he still refuses to eat. <If you can do this safely, set him down in one room in the house and just let him wander. There are any number of reasons why he's restless and we can't determine all of them, but perhaps if we let him do what he wants to do, he'll settle down. Just look around the room and make sure it's safe - no small things to eat, no vents to fall into, etc. sooo I came to Iran to teach English and I go to a fellow teachers house and he has what I would call a terrapin. It has red marks on its necks so from my research I think it's a red-eared terrapin. He had been keeping it in a tub of water for weeks and weeks. No basking area no sun light no this nor that just a tub of water, like an ice-cream tub. It can't open its eyes and it's absolutely tiny. Any way obviously I took the poor thing off him (his name is now timothy) (the turtle not the guy) but now I don't know what to do! I have a huge bowl (HUGE) that I've put timothy in with water, and I've put some cups as kind of land areas, which he can easily swim onto. But you need to understand that Iran has no fancy tanks or tank filters or anything. So how would you suggest I deal with this? Do you have any DIY tips? AGH! -- and with the sunlight thing, its winter now and there is very little sunlight, what do I do? On the bright side the guy I got timothy from had lots of shrimp, so I can give him that. and Timothy seemed to enjoy his new huge swimming pool. Oh and also should I ban him from water for a while? He was literally living in a tub of water with no land area or 'basking' whatever, surely that's not good for him? I have a red-eared slider that I rescued from the road a few years ago. It is about the size of an average woman's hand. Yesterday while cleaning his tank I dropped a very small piece of paper towel in the tank, which he swallowed. I am worried that it will cause him difficulty in breathing or digesting/processing through. Can you please tell me what, if anything, I should do? Veterinary care is unavailable in my rural area. Thank you for any advice you can provide. I am most grateful for your kind consideration and assistance. I have a seven year old Red Eared Slider. He started vomiting one day, several times. I noticed that he was also starting to not swallow completely. I took him to the vet and had an x-ray done. There were some little spots in his stomach. The vet said to give him mineral oil and Metamucil. I did that for about a week. I am suppose to take him back to the vet for more x-rays, but don't really have the money. I haven't seen him defecate and the filters aren't getting dirty. I am afraid that I am just packing him full, with nothing coming out. 3) He has some other form of obstruction that requires surgery. haven't seen him eat even once! the other one was initially fine... would swim around and eat the minute I'd give it food. but for the last two three days she also now mainly sits in the basking area with her eyes shut tight... even when she's in the water she swims for maybe 5 min.s a day... otherwise just floats with her eyes closed, when does open her eyes only one is open and the other one she seems to keep scratching as if its bothering her... and she hasn't eaten either... the other one for the last two days has just been sitting out of the water in the basking area, with his eyes closed... if I even put him in the water he quickly gets out... I do have a water filter for them and they don't have a UVA OR UVB light they have a normal 100v bulb.... is that okay?? I really don't want them to die... p.s where I live there isn't any proper reptile care place.. .as in medicines and stuff!...so what can I do to make them better? do I need to separate them? the one who was doing okay at first always sleeps on the other one in the basking area... ? what do I do???? and is this vet a quack!!!!?? 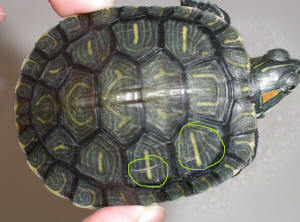 2) Has this turtle been showing any of these symptoms? What specific antibiotic did she administered to him for the respiratory infection? What dosage did she give him of that medication? How many grams does he weigh? 4) Get a 2nd vet opinion if you have any concerns about her advice (preferably a vet who specializes in turtles/reptiles - even a vet who cares for birds can be knowledgeable about questions concerning turtles). Provide the 2nd vet with the above information regarding current symptoms, the specific medication and dosage he was given, and how much he weighed. 6) You can also try locating/contacting a local aquarium, zoo or nature center for their help, or for a vet recommendation. Also check to see if there is a turtle or tortoise club or society in your area to see if you can speak to an experienced hobbyist who might be willing to look at your turtles. 1) Keep them both warm and dry (follow guidelines in article for this), except for 20 minutes or so each day in shallow water to drink, poop and eat (if they can). 3) Even if you take them outside now, given how debilitated they seem to be, Id still suggest you supplement the sun with the artificial UVB light, while continuing to give them as much sunlight as you can. There is no substitution for the sun, but UVB supplementation is still essential if they are indoors most of the time. 4) Assuming you can get them to eat, Id also get a good quality calcium with Vitamin D powder, sprinkle a bit on a good quality pellet (like Koi pellets or ReptoMin) and let it soak into the pellets for 20 minutes or so before feeding them. <I also sent you (below) some additional links for vets that I found for your specific area. You may want to call the Karachi Zoo and ask to speak to one of their exotics experts to see if they can either assist you, or recommend any of the vets on the links I sent you as far as someone who has special expertise with turtles. Subject: Re: RES urgent help!! <Now, Najia, it's time to turn our attention to the remaining turtle. hi Sue and your team! but your whole team has been so great and sooo helpful I really couldn't thank you enough! sitting half way across the world you guys have managed to help me out as much as possible and I really really appreciate the effort! you guys are really doing an amazing job and I am honestly amazed and happy to know that people like you guys exist and do what you do!!! see a vet, which unfortunately even in this case still wasn't enough. It's too bad there aren't more stringent controls placed on the people who sell turtles, fish, etc. I just hope in my next lifetime I don't come back as a "pet shop" pet! I am the owner of 4 red eared slider, all of whom are over 20 years old and have been in my care, save one, the whole time. I feed my turtles both "meat" and greens and have never had any trouble, not even a slightly soft shell. About a month ago I noticed my oldest turtle looked like he was losing weight. He is in a large tank with direct sunlight, a thermometer on the tank and all the other turtles are just fine. I've been watching him carefully since I noticed his weight loss. He seemed to eat with the other turtles but was slower about getting the food. I realized that the other turtles had taken to sitting on him when the water was lower and so I've kept an eye on that too and have chased them off of him. This last week he hasn't eaten at all and I picked him up to find he has what looks like bruising in many spots on his body. He is listless and his limbs hang when you pick him up. I made numerous phone calls before resorting to this email out of sheer desperation. I am not close to a vet that treats red ear sliders and the after hours clinic that will take him this weekend I simply do not have the money for. I have isolated him and have a lamp over his enclosure. I'm trying to figure out how to put a bowl of water in with him or whether I should just eye drop water into him every hour. I am also going to get cod liver oil within the hour to start administering that to him. I will get him to a vet on Monday (it's Saturday afternoon right now). Do you have any idea of what is going on and is there anything I can do for him between now and Monday? I have two red eared sliders, have had them for nearly two years. Their names are Percy and Shelley. They live in a tank in my lounge room which does not have a UVA/UVB light (You cannot buy them in Vietnam for love or money), but now I have moved house I put them outside on my balcony every day so they can bask in the sunlight to get healthier. However, Shelley has developed swollen eye problem in both eyes, which seems to be quite common among these little ones! He looks exactly like several of the photos on this site. My questions relate to treating this problem in a third world country, which, as you can imagine, presents problems. Firstly, most Vietnamese don't keep turtles as pets - they eat them. Consequently there is no decent vet here who can treat a turtle. The only one who I have seen knows very little about them, and upon seeing the problem just said it was Vitamin D and sent me home to get some drops from the chemist. Which presents my second problem. How can I treat my little one when the vets don't stock the necessary supplies to treat them? Is there a generic people-medicine I can use to help treat his eyes? If so, what dosage should I give him? He has stopped eating, and though still has some energy, I am very concerned that he is slowly suffering. I have followed advice and put him out of the tank, but I fear it's gone to far and that's not enough. As you can imagine, it is incredibly frustrating here to find some assistance. Please please, do you have any ideas? I am returning home to Australia over Christmas, but I am terrified that this will be too late and he will die before I can make it back in time. Finally, what about diet? I have turtle pellets, but they come from China, and I am not convinced they are good for the turtles, though they have been eating them for the past two years and never had any issues until now. Unfortunately I can get no other "turtle food" for them, so I need to make something myself. Suggestions on what is good to make and store would be appreciated! Please, any assistance you can give me would be appreciated. I am totally at my wits end!!! PS - I will add that Percy, the other turtle, seems to be completely fine. I'm Cristy. I have a female red eared slider which I rescued from a flood about a year ago. I'm worried about her condition regarding the skin in her legs. I noticed this skin when she got fat because of the fishes we gave her. It looks like it was swollen. But when I put her in a diet, which consists of turtle pellets and vegetables, this skin became loose. It shrunk but it never did go back in its normal size. What do you think this is? I have attached a picture of her.. I'm really hoping you can help me out!! We have an adult, female Red Eared Slider (she is about 10 inches long). She lives in our outdoor pond which is 20 foot by 30 foot and 5 feet deep. We have Koi, goldfish and Shubunkin that live in the pond with her. We just got back 2 days ago from 3 weeks of vacation and found that the waterfalls had apparently stopped working early on our trip and our friend just left the pond and threw food in. The water was pretty stagnant and gross when we got back. The RES was out of the water when we first saw her and she jumped in right away and swam at the surface and then the second we walked back in the house she got out. About an hour later we went out again but she just sat there and didn't move. We went to pick her up and she was very lethargic and her eyes were puffy and swollen. We immediately isolated her and she's now in the house in a full size bathtub. We have a heater in the room and the temperature is 87 where we have her. We've got a little water (about an inch deep) at one end and then no water at the other end. She's poking her head out and we were just putting ReptoMin in with her but she wasn't eating it (in the pond we give her Koi pellets and the ReptoMin). So, we went out today and got her an earthworm and fed her the earthworm and the ReptoMin with a dropper. We were able to get her to eat that by basically force feeding her. She's always been an outside turtle (we got her about 2 years ago from someone who also always had her in their outdoor pond). Because she eats with the Koi I don't really know how much she's getting all the time. I want to make sure that we're feeding her adequately while we work to try to get her better. Can you confirm how much we should feed her exactly? She doesn't seem to have a runny nose and the only other issue she had was a small amount of scute shedding but we haven't noticed that problem since we brought her inside. Her shell does appear nice and hard and normal. We obviously won't put her back in the pond until she's completely healthy and we have the water back to 100%. Is there any treatment that would be good for her eyes that we can do? I also would like to confirm that, in your opinion, we're caring for her as we should while she recovers. If you have any other advice I would greatly appreciate it. We are trying to see if we can get her better on our own but will take her to the vet if necessary. Thank you for any assistance you can provide. If I can provide you additional information to help you respond, please let me know. I wanted to thank you for your feedback and give you an update. Our RES is doing great. She's been eating, has lots of energy and is back to 100% - her eyes are clear and everything. I think the earthworms and cod liver oil really did the trick. I found that getting the cod liver oil into a straw and then dripping it into her mouth worked great. She's been doing so well that we released her back into our pond last night and have been keeping a close eye on her. She's swimming around, was eating the Koi pellets we put out there and seems very happy once again. Again, thank you for your advice and quick response. I love your site but was unable to find my answer so here I sit writing to you ... 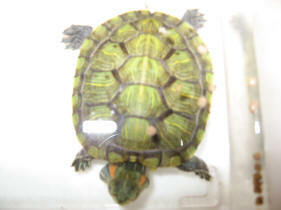 I have 2 Red Eared Sliders - both we got as quarter sized turtles. Randolf is about 15 1/2 yrs old and doing great. Squirt will be 3 this summer. They are in separate aquariums .. my concern is Squirt. The last few days, he seems to flip himself over ... he has plenty of clean swimming area and also a rock to get up on and sun. Today I noticed him holding his head out and back .. as if someone pulled it out and bent it backwards .. I have had three red ears for many years. <Oh wait. Maybe you meant you have three different Red Eared Sliders. They have always been healthy and on a diet of mostly fish and shrimp. I noticed last week that they were not eating and this week I see that the noses are rotted away. On two of them it seems to be only the noses. The third, has its upper eyelids and inside its mouth also affected. There is no pus or abscess on the nose. The eyelids are red and sore. The mouth also looks red and sore. They are eating in small amounts. The shells are hard and do not show signs of damage. There are no visible signs of skin issues on the neck or legs. Breathing is slightly labored on the turtle with the nose/eye/mouth problems but not for the other two. There is no sign of mucus or nasal discharge from any of them. I cannot find any info about this condition or how to treat it. If this turtle has been feeding primarily on goldfish and shrimps, it is VERY likely to be suffering from a Vitamin B1 deficiency. Both goldfish and shrimps contain a lot of thiaminase, and over time, this causes all sorts of problems for reptiles. It's a fairly well recognised syndrome in reptile care, certainly when compared to fishkeeping. As you correctly state, red-ear sliders should be fed a largely plant- based diet. Whether this is live plants or pellet foods based on plant foods (such as Koi pellets) probably doesn't matter too much, though as always, variety helps. Vitamin B1 deficiency will of course reduce the effectiveness of the immune system, so secondary infections of the eyes and respiratory tract will be more common. It sounds as if these turtles are suffering from these problems. A vet will be able to prescribe the appropriate medications, and will also give vitamin injections to provide a quick boost. These turtles must see a vet, and soon, if further suffering is to be avoided. <Hiya> my name's Adam from Malaysia. I have a very sick red eared slider with swollen eye for about 1 week, have been using turtle eyes drop but without the vitamin A in it (cant get the zoo medic brand). How do I get it to eat if it won't open it's eye? How long can it survive without eating? What is the duration of treatment with the eye drops? Currently it's quarantined all day, I only it let in distilled water for 15 min.s a day max. As for a vet, cant find one who knows the stuff here.